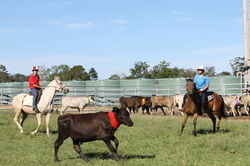 The Mid North Coast Team Penning Association meets once a month. We have a great set up at the Unkya reserve, about 15 km south of Macksville and we are settled in nicely. The arena now has a sand surface in it with great footing for the horses. Come along and watch an event or bring your horses along and have a go! You'll love it, we do!! This would have to be the cheapest horse sport the whole family can enjoy. It’s a great way Mum, Dad & the kids can play with their horses all together and enjoy the days activities. The club has seen a big family turnout over the last few years, but encourages anyone & everyone to join. If you want to give it a go but can’t put a team together, we are always looking for people on the day to fill vacant positions. 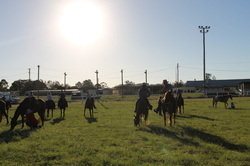 It’s a great club to meet people who enjoy the same thing you do – horses. 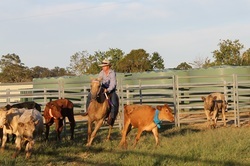 Team Penning would be impossible without cows, all of which are sourced locally. We have two main cattle suppliers that have been supporting us for several years now. A big thank you must go out to those who have supplied cattle for us in the past. Without them, Team Penning would be a non event. Be sure to check the event calendar for the next Team Penning date. SEE YOU AT THE PENNING ! !